*430 BC Athen - †355 BC ? Xenophon is mentioned by the author when he introduces the reader to the term "anabasis". Xenophon exemplified the anabasis by travelling around anywhere without a map. Xenophon was a Greek commander, author and historian. He was particulalrly known for his historical descriptions of ancient Greece, his writings on Socrates, and for the first eyewitness account of a battle in ancient times. Xenophon's language is clear and concise, and has set standards on writing style. The book "Anabasis" describes the Greek mercenaries treacherous road back home though Asia Minor after a failed mission against the King of Persia. It is a seven-volume work and is considered Xenophon's best. The theme Xenophon and his Anabasis was evidently well known to Jaroslav Hašek. In Letters from the front, Čechoslovan 9.10 (26.9) 1916, his name also appears, one of many testimonies to the author's interest in ancient Greece. It is also one of many examples in Švejk of reuse of fragments from Hašek's earlier writing. [2.2] Starověký válečník Xenofon prošel celou Malou Asii a byl bůhvíkde bez mapy. Staří Gotové dělali své výpravy také bez topografické znalosti. Mašírovat pořád kupředu, tomu se říká anabase. Prodírat se neznámými krajinami. Být obklíčeným nepřáteli, kteří číhají na nejbližší příležitost, aby ti zakroutili krk. Julius Caesar is mentioned by the author when he introduces the reader to the term "anabasis". Caesars legions got all the way to the Gallic Sea without maps. Caesar is also mentioned on one of the last pages of the novel. Julius Caesar was a roman commander, politician and author. He had become most potent citizen of the empire when he was murdered by senator Brutus in 44 BC. At that time he held the title "dictator in perpeteo". During his reign he undertook extensive reforms, centralising the administration. The area of the empire was greatly extended, including Britannia. [2.2] Tam někde na severu u Galského moře, kam až se také dostaly římské legie Caesarovy bez mapy, řekly si jednou, že se zas vrátí a pomašírujou jinou cestou, aby ještě víc toho užily, do Říma. A dostaly se tam také. Od té doby se říká patrně, že všechny cesty vedou do Říma. Mašků had ran away from the "Landwehr" but was caught soon after. He was the husband of a niese of the old lady who helped Švejk by Vráž. The latest news was that he had lost a leg at the front. Melichárek was a farmer and brother of the old woman from Vráž. He lived in Radomyšl in Dolejší ulice. He was very suspicious of Švejk who he assumed had defected from the army. Melichárek is supposed to have been Václav Melichar and lived in Dolejší ulice, just as the author writes. According to his descendants, Hašek was in Radomyšl in 1915 and Melichár's wife is said to have made him bramborovka. The mystery is how the author got this far from Budějovice without being noticed (60 km). [2.2] V Radomyšli Švejk našel k večeru na Dolejší ulici za Floriánkem pantátu Melichárka. Když vyřídil mu pozdrav od jeho sestry ze Vráže, nijak to na pantátu neúčinkovalo. Chtěl neustále na Švejkovi papíry. Byl to nějaký předpojatý člověk, poněvadž mluvil neustále něco o raubířích, syčácích a zlodějích, kterých se síla potlouká po celém píseckém kraji. Herrmann was a Jew in Vodňany who bought military euipment that he sold on to the army. In the opinion of the tramp at Švarcenberský ovčín, he would also buy Švejk's uniform. [2.2] „Tak ten si nech. V tom se na venkově chodí. Potřebuješ kalhoty a kabát. Až budeme mít ten civil, tak kalhoty a kabát prodáme židovi Herrmanovi ve Vodňanech. Ten kupuje všechno erární a zas to prodává po vesnicích. Jareš was a pond warden from Ražice whose grandfather was executed for desertion during the Napoleonic Wars. This is according to a story by the old shepherd at the Švarcenberský ovčín. [2.2] Z Ražic za Protivínem syn Jarešův, dědeček starýho Jareše, baštýře, dostal za zběhnutí prach a volovo v Písku. A před tím, než ho stříleli na píseckých šancích, běžel ulicí vojáků a dostal 600 ran holema, takže smrt byla pro něho vodlehčením a vykoupením. Jareš was the grandfather of the pond warden from Ražice, and was executed as a deserter during the Napoleonic wars. This is revealed during the conversation at Švarcenberský ovčín. Schwarzenberg is mentioned by the old shepherd in Švarcenberský ovčín. He tells us that at least the old Schwarzenberg moved around in an ordinary carriage but nowadays the young prince drives around in an automobile, and that the Good Lord will rub his snout in petrol one day. Schwarzenberg is probably the person referred to as old prince Schwarzenberg. He was head of the Krummau barnch of the Schwarzenbergs who owned large properties in Bohemia until 1918. He was the 9th prince of Schwarzenberg and 7th duke of Krummau (Krumlov). Schwarzenberg is mentioned by the old shepherd in Švarcenberský ovčín. He tells us that at least the old Schwarzenberg moved around in an ordinary carriage but nowadays the young prince drives around in an automobile. Schwarzenberg is probably the person referred to as the young prince Schwarzenberg. He was the 10th prince of Schwarzenberg and 8th duke of Krummau (Krumlov). The family estate was first confiscated by the Nazi's in 1938 and in 1945 he was expelled on background of the Beneš-decrees. Another possible candidate is Karl V. Schwarzenberg from the Orlík branch of the family. He died near the Serbian front in 1914. In that case the old Schwarzenberg was Karl IV who passed away the year before. Kořínek was arrested for sedition in Skočice after saying that after the war one would get rid of Emperors, and that the nobility would have their estates confiscated. This is what the tramp told Švejk and the old shepherd in the Schwarzenberg speep-pen. Flanderka was head of the gendarmerie in Putim and suspected Švejk of being a Russian spy. He considered himself a master of interrogation techniques and it soon became clear to him that Švejk was indeed a spy. The more he tanked up, the clearer it all became. He and his deputy also made complete arses of themselves with extremely seditious talk when they had had a drop too much. Austria was going to loose the war, a Russian prince would become King of Bohemia and Emperor Franz Joseph I, was shitting all over Schönbrunn. The petrified old servant Pejzlerka who had witnessed it all, had to swear never to tell a living soul what she had heard. Berger was a duty-conscious obrlajtnant from the artillery who according to Národní politika had established an observation post in a tree, and hid there for two weeks to avoid captivity. When his own troops returned he fell down and killed himself. The story is told by Flanderka at Putim gendarmerie station. [2.2] To jsou, pane závodčí, povahy. K tomu je třeba ocelových nervů u takového člověka, sebezapírání, tvrdosti a nadšení. Kdyby bylo v Rakousku takové nadšení... ale nechme toho raději. I u nás jsou nadšenci. Četli v ,Národní politice’ o tom obrlajtnantovi Bergrovi od dělostřelectva, který si vylezl na vysokou jedli a zřídil si tam na větví beobachtungspunkt? Bürger was Flanderka's predecessor as head of the gendarmerie in Putim. He never interrogated anyone, just sent them on to Písek. [2.2] Vzpomněl si na svého předchůdce strážmistra Bürgera, který se zadrženým vůbec nemluvil, na nic se ho netázal a hned ho poslal k okresnímu soudu s krátkým raportem: „Dle udání závodčího byl zadržen pro potulku a žebrotu.“ Je to nějaký výslech? Pepík Vyskoč was a village idiot who Flanderka tried to hire as an informer. He was told to report anyone who said the Emperor was a piece of cattle. Pepík took this literally, he told others that Sergeant Flanderka had said that the Emperor was cattle and that the thing couldn't be won. He was arrested and sentenced to twelve years by the military court in Prague. He got the nick-name because he bleated like a goat and jumped in the air when someone talked to him. This is a character that almost certainly was inspired Václav Kompert (or Kompich? ), also known as Venca Vyskoč. Firm evidence is provided by Sergey Soloukh (2015) who points to him as a curious character from Prague with some striking similarities with the character from the novel. "Venca" even frequented U Fleků, a tavern the author knew very well. Vyskoč is mentioned in several books that have been published over the past 30 years, and the information is more or less the same. In the book Jak se bavila Praha (2009) the authors Miloš Heyduk and Karel Sýs state directly (p. 137) that Venca was the model for Pepík. When "Venca" died on 18 September 1916 at the age of 65, several national newspaper printed the news. Lidové noviny even provided a more detailed obituary. Václav Kompert was a former waiter who had some bad luck in life that affected him mentally. He started to walk around pubs and café's, bleated and jumping at the tables and collected money for his spectacle. He became a well-known but tragic characters in the streets of Prague. His main area of operation was around Václavské náměstí. The description in this obituary is so close to Jaroslav Hašek's own that there is not even the slightest doubt where the inspiration for the name, the jumping and the bleating came from. Augustín Knesl also made a note on the connection between "Venca Vyskoč" and Pepík Vyskoč in his serial in Večerní Praha (1983), and refers to an article by Karel Ladislav Kukla in České Slovo from 1924. Far less credible is Vladimír Stejskal (1953) and his claim that the inspiration was a character from the area around Lipnice nad Sázavou. The evidence is weak: not much more than pure hearsay. [2.2] Toho si dal zavolat a řekl k němu: „Víš, Pepku, kdo to je starej Procházka?“ „Méé.“„Nemeč, a pamatuj si, že tak říkají císaři pánu. Víš, kdo je to císař pán?“ „To je číšaš pán.“ „Dobře, Pepku. Tak si pamatuj, že když někoho uslyšíš mluvit, když chodíš po obědech od domu k domu, že je císař pán dobytek nebo podobně, hned přijď ke mně a oznam mně to. Starej Procházka is mentioned by Flanderka when he recruits Pepík Vyskoč. Starej Procházka was a Czech nickname for emperor Franz Joseph I. In 1901 he visited Prague and a picture of him appeared walking on Most císaře Františka I., now Most Legii. The picture had the title Procházka na mostě, and was from the opening of the bridge on 14 June. "Procházka" is a common Czech surname which rougly means "walk" (noun) or "walkabout". Rampa was a gendarm (četnik) in Putim who was on inspection-duty of the neighbouring villages when Švejk was there, but was right now playing cards in U černého koně in Protivín. Pejzlerka was an old woman who served at the police station in Putim. She went back and forth to Na Kocourku bringing beer. Unfortunately she overheard the politically suspect conversation between the drunk gendarmes and had to swear to the cross not to say a word. 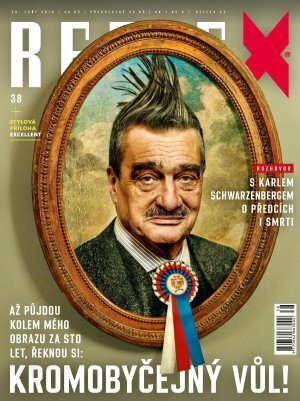 [2.2] A bába Pejzlerka, která jim posluhovala, se opravdu proběhla. Po večeři se cesta mezi četnickou stanicí a hospodou „Na Kocourku“ netrhla. Neobyčejně četné stopy těžkých velkých bot báby Pejzlerky na té spojovací linii svědčily o tom, že strážmistr si vynahražuje plnou měrou svou nepřítomnost „Na Kocourku“. Nicholas Nikolaevich is mentioned when it is revealed what unpatriotic views were uttered during the drinking bout at the gendarmerie station. Nicholas Nikolaevich would soon be in Přerov, Flanderka is reported to have said. Nicholas Nikolaevich was Russian commander in chief from the outbreak of war until August 1915 when his cousin czar Nicholas II personally took charge. This was a result of the setbacks suffered during the summer of 1915 when Russia was forced out of Poland and Galicia. Chaura was a butcher from Kobylisy, part of a story Švejk tells his guard on the way from Putim to Písek. [2.2] „To byl bych si nikdy nemyslil,“ vykládal Švejk, „že taková cesta do Budějovic je spojena s takovejma vobtížema. To mně připadá jako ten případ s řezníkem Chaurou z Kobylis. Ten se jednou v noci dostal na Moráň k Palackýho pomníku a chodil až do rána kolem dokola, poněvadž mu to připadalo, že ta zeď nemá konce. Palacký is mentioned by Švejk in the story about the butcher Chaura who walked round the Palacký-monument at Moráň the whole night. In Book Three in Budapest he is quoted by Dub as follows: if there weren’t Austria we’d have to create it. Palacký was a Czech historian and politician who played a pivotal role in the Czech National Revival. He was also called otec národa, the father of the nation. He was loyal to the Empire although he became more radical after the Austro-Hungarian Ausgleich in 1867. Most Czechs resented that the Hungarians got a special status within the Empire, and these feelings were aggravated as Franz Joseph I didn't want to be crowned King of Bohemia. König was Station Commander (rytmistr) at Bezirksgendarmeriekommando in Písek, and very diligent, an outstanding bureaucrat. “If we want to win the war,” he said, “an ‘a’ must be an ‘a’, a ‘b’ a ‘b’, and everywhere there has to be a dot over the ‘i’.” He received Švejk and correctly sent him south to join his regiment which he for many days had looked for in vain. is surely an invented person. The position in question was held by none other than Theodor Rotter, throughout the whole war. Matějka was master sergeant at Bezirksgendarmeriekommando in Písek. He was keen on getting off for a game of "Schnaps" down by the Otava but König held him back, and thought to himself that the police chief could kiss his arse with all these reports. [2.2] Rytmistr studoval „bericht“ četnického strážmistra z Putimě o Švejkovi. Před ním stál jeho četnický strážmistr Matějka a myslel si, aby mu rytmistr vlezl na záda i se všemi berichty, poněvadž dole u Otavy čekají na něho s partií „šnopsa“. Hercules is mentioned by rytmistr König when Švejk tells him about his efforts to join his regiment. The term is: "a Herculian job". Hercules was a Greek demigod, son of Zeus, known for his strength. There were twelwe of the tasks mentioned in the novel, each and one of them quite a challenge. Rampa was a pubowner in Královské Vinohrady, mentioned by Švejk when he tells rytmistr König at Bezirksgendarmeriekommando Písek that there would have been no point in telling vachmajstr Flanderka in Putim his name or what regiment he belonged to. Rampa (Josef) actually owned a pub in Královské Vinohrady as the address bok from 1910 here shows. Koťátko was an ensign in IR91 who witnessed Švejk's appearance at the barracks in Budějovice, and watched Lukáš passing out as a result of seeing his servant again. Later he related about the incident, for instance that Švejk saluted during the whole sequence. Materna was a one-year volunteer and an acquaintance of Marek. The latter mistook Materna for an artillery officer, knocked his cap off as a friendly gist, but this was a costly mistake. He was now sharing a cell with Švejk. A certain František Materna was owner of U Valšů (address book from 1910) and hence a person Jaroslav Hašek surely knew, and might have served as an inspiration. Whether or not this Materna was a one-year volunteer and served in Budějovice in 1915 can however not be established. [2.2] Stalo se to tak, že ten poručík od dělostřelectva stál v noci pod podloubím a patrně čekal na nějakou prostitutku. Byl obrácen k němu zády a jednoročnímu dobrovolníkovi připadal, jako by to byl jeho jeden známý jednoročák, Materna František. Anton was the artillery officer Marek mistook for Materna. Masák was a doktor from Žižkov, brother-in-law of Marek who helped him prolong his stay in the military hospital in České Budějovice. [2.2] Do Budějovic byl přeložen můj pošvagřenec Dr Masák ze Žižkova a tomu mohu děkovat, že jsem se tak dlouho v nemocnici udržel. Byl by to se mnou dotáhl až k supravisitě, když jsem to ale tak zkazil s tím nešťastným ,krankenbuchem’! 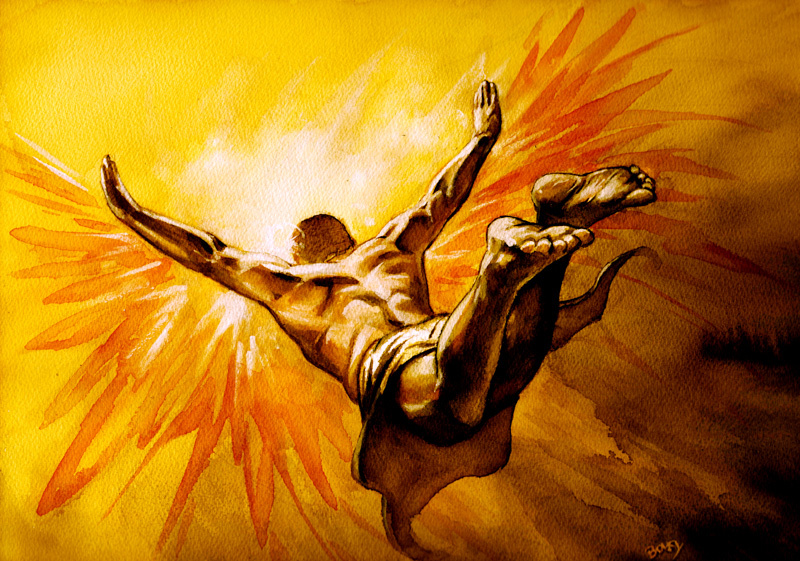 Icarus is mentioned ny Marek when relating about his misadventures and that "Pride preceedes the fall". Icarus is a character in Greek mythology. He is the son of Daedalus and is commonly known for his attempt to escape Crete by flight. He stuck wings to his body by wax, was warned not to fly too close to the soon, ignored this advice with the result that the wax melted and he fell in the sea and drowned. [2.2] Pýcha předchází pád. Všechna sláva polní tráva. Ikarus si spálil křídla. Člověk by chtěl být gigantem - a je hovno, kamaráde. Schröder was colonel and commander of IR91 Ersatzbattailon in Budějovice and Bruck an der Leitha and plays a prominent role in the four chapters where the action takes place in those places. He is described as a bully and a swine but the author later assigns him a partial sense of justice. His incompetence is never in doubt, a distinction he shares with most officers in K.u.k. Heer. Parts of the information about Schröder comes from Marek's telling Švejk about the situation the regiment in the prison cell in Budějovice. In [2.4], during the investigation into the letter scandal in Királyhida Schröder is more kindly treated by the author: although a swine still, it becomes clear that he defends his own men, even the Czechs. He clearly doesn't like Hungarians and it is evident that he has previously served in Hungary, and Eger is specifically mentioned. The identity of Schröder has long been unclear, but he was according to Bohumil Vlček commander of IR91 Ersatzbattailon in Budějovice and then for a short period in Bruck an der Leitha. This fits well with the novel, but it still appears that Vlček mixes up names: the colonel who was in charge of replacement battalion at the time was named Schlager. For more extensive information, see Karl Schlager. [2.2] Obrst Schröder přijel na mne přímo na koni a div mne nepovalil na zem. ,Donnerwetter,’ zařval, až to bylo slyšet jistě na Šumavě, ,was machen Sie hier, Sie Zivilist?’ Odpověděl jsem mu slušně, že jsem jednoroční dobrovolník a že se zúčastňuji cvičení. Wohltat was a one-year volunteer, later corporal, who Schröder, bellowing at Marek, informed him was a prime examples of military heroic deeds, as opposed to Marek himself. Wohltat was promoted again, five minutes after having been torn apart by a grenade. [2.2] Jednoroční dobrovolník Wohltat, byv po odbyté zkoušce povýšen na kaprála, dobrovolně přihlásil se na frontu a zajal 15 nepřátel a při odevzdávání jich byl roztržen granátem. Za pět minut došel pak rozkaz, že jednoroční dobrovolník Wohltat je povýšen na kadeta. Saint Agnes was used ironically by Marek when he addressed the guard contemptuously as "Saint Agnes of the 91st Regiment". Saint Agnes was a daughter of king Otakar I of Bohemia, but renounced a life in the circles of power and dedicated herself to religion and caring for the ill.
NB! There are several other Saint Agnes around, and it is not stated directly that this is the person in question. Pushkin is mentioned by Marek who compares the monarchy to Pushkin's uncle who has as good as become a carcass. Pushkin was a Russian author of the Romantic era who is considered by many to be the greatest Russian poet and the founder of modern Russian literature. Kočí published the book Sources of economic prosperity which Marek refers to when describing the language the lower-rank officers use. This consists mainly of names of animals. Kočí was a Czech publisher, book trader and author. He often used pseudonyms. Today he is best known for theosophical writing and his work on mental health. The book that Marek mentions was published in 1906 and has 910 pages. It contains themes like forestry, animal breeding, sugar growing, sopil... No specific author is known, so it may well be reference work. Zdroje hospodářského blahobytu: kniha pro každého kdo chce brzo a poctivě zbohatnout (B. Kočí 1906) pův. vazba, 910 stran. Témata jsou uspořádána abecedně A–Ž: cukrovarnictví, dobytek, lesní hospodářství, půda atd. [2.2] Vytřískat nový válečný živý materiál a vojensky uvědomělá sousta pro jícny děl, k tomu je třeba důkladných studií přírodopisu nebo knihy ,Zdroje hospodářského blahobytu’, vydané u Kočího, kde vyskytuje se na každé stránce slovo: dobytek, prase, svině. Althof used the innovative swearing expression "You Engandin Goat" at the soldiers. This is a part of Mareks lecture to Švejk on the language employed by the lower rank officers. [2.2] U 11. kompanie kaprál Althof používá slova: engadinská koza. Svobodník Müller, německý učitel z Kašperských Hor, nazývá nováčky českými smraďochy, šikovatel Sondernummer volskou žábou, yorkshirským kancem a slibuje přitom, že každého rekruta vydělá. Müller was a lance corporal from Kašperské Hory, teacher in civilian life, who used to call the recruits Czech stinkbags. Sondernummer was a sergeant who used to address the recruits as Yorkshire boars and also promised to flay and stuff them. Dauerling is never part of the plot, but is described by Marek as a particularly stupid and brutal ensign. He got a knock on his head when he was little and his mental horizon had suffered ever since. According to Marek this made him perfectly suitable for a military career, and the fact that his father was a colonel pre-determined his destiny. He had attended Pionierkadettenschule Hainburg, where he distinguished himself through his gross stupidity, and when the war started he arrived at IR91 in Budějovice as an instructor. There he became notorious for his brutality towards the Czech recruits until one day major Wenzl had enough and put a stop to his behaviour once and for all. This despicable ensign has in the secondary literature about Švejk never been associated with any particular real person, although his negative qualities (obviously caricatured) are surely inspired by one or more officers that the author knew or had heard about. When investigating Dauerling it is of interest to compare the novel with Dobrý voják Švejk v zajetí (1917) where the junior officer is assigned a much more important role. The author’s description of him is nearly identical to Marek’s version from the novel: accident as a child that led to a malformed skull, exceptionally stupid and brutal, educated at Pionierkadettenschule Hainburg, had read Drill oder Erziehung (see Orth), quoted Conrad, rank Fähnrich etc. Thereafter there are however big differences. In Királyhida and at the front Dauerling is the main character alongside Švejk. He actually takes on part of the role that Lukáš has in the novel. Our good soldier is his servant and steals a dog for him, the affair with Kákonyi is there with similar details. It is also striking that the author assigned an servant to such a low ranking officer as an ensign. This may not mean much, but could also indicate that Dauerling's model(s) had a higher rank. The family name Dauerling is extremely rare, underpinned by the fact that neither the address books of Prague nor Vienna from the period in question contain any such entry. Modern name databases show up less than ten hits. It is therefore to be expected that there is no Dauerling in neither officer's lists nor casualty lists from K.u.k. Heer. One can imagine that the author borrowed the name by chance from news reports that mentioned some Dauerling. These were still few, but one such case springs to the eye: the music teacher Dauerling in Hollfeld in Bavaria beat a nine-year old girl so severely that she died. This happened on 11 February 1908 in front of the whole class and was reported in many newspapers in Austria, including Czech publications. Most German-language newspapers also added that Dauerling was a Jew. The reports from the Hollfeld tragedy also reveal a possible misspelling. Most newspaper in fact referred to the teacher as Deuerling. Čech and Lidové noviny used Dauerling whilst Národní politika and most German language newspapers used Deuerling. The latter is also a more common name, but still not widespread. There are in fact Deuerlings living in Hollfeld to this day. In the entire armed forces of Austria-Hungary there was only one officer named Deuerling. He served in Landwehr and can hardly have been known to Hašek. As no Dauerling or anyone with a similarly sounding name can be located to IR91, possible inspirations may be any officer in the regiment with a some reputation as a tyrant. In his series in Večerní České Slovo in 1924 Jan Morávek mentions a certain captain Wimmer. Jan Vaněk remembers him as commander of his march company in IR91 11th march battalion. Morávek describes Wimmer as "a lunatic who tyrannised the soldiers and even pulled his horse to battalion report". Immediately before the departure to he front he was replaced by Rudolf Lukas. There was only one officer in IR91 that fits the name and rank described by Jan Morávek. This was Hauptmann Otto Wimmer who in the summer of 1915 became commander of the 13th march battalion. They arrived at the front by Bug on 15 August 1915 so from then on Jan Vaněk may again have had to deal with him. The connection between Dauerling and Wimmer is still only vague; there is for instance a great difference in rank between the two (without this necessarily have been seen as important by the author). Captain Wurm. From the book "Jednadevadesátníci", Jan Ciglbauer, 2018. We do not know of alternative sources that confirm captain Wimmer's alleged brutality, and recently published information actually clears his name entirely. Thanks to information in the book Jednadevadesátníci (Jan Ciglbauer, 1918) we can now conclude that Morávek referred to captain Hans Wurm, an officer who according to several witnesses was notoriously cruel, bordering on madness. The key phrase is "pulling his horse to battalion report". This is exactly what Wurm did in Királyhida in 1916, and soldiers from IR91 later remembered both this incident and other examples of his senseless brutality. Still it would be far fetched to claim that Wurm was a model for Dauerling. Apart from their common cruel behaviour their life and army career had little in common. Dauerling thus joins the list of figures in the novel who are without an obvious real-life counter-part: Katz, Wendler, Chodounský, Baloun, Jurajda, Dub etc. [2.2] Když vypukla válka a všecky mladičké kadetíky udělali fähnrichy, dostal se do archu hainburských povýšenců i Konrád Dauerling a tak se dostal k 91. regimentu.“Jednoroční dobrovolník si oddechl a vypravoval dál: „Vyšla nákladem ministerstva vojenství kniha ,Drill oder Erziehung’, ze které vyčetl Dauerling, že na vojáky patří hrůza. Podle stupňů hrůzy že má též výcvik úspěch. Conrad is mentioned in connection with Dauerling who recited parts of Conrad's infamous quote: Die Soldaten müssen sowieso krepieren. (Soldiers must peg out anyway). The authenticity of this quote has not been verified. It should also be noted that Conrad obtained the rank Field Marshall only in 1916, so Marek was looking well into the future during this dialogue with Švejk that logically must have taken place in 1915. A similar situations and an equally grotesque quote can be found in Dobrý voják Švejk v zajetí (1917). Here the author is more direct and claims that Conrad said that "Die Tschechen müssen so wie so krepieren" and that this utterance took place in early January 1916 in Innsbruck in presence of the 8th Infantry Division. Dauerling is like in the novel linked to the quote but it has not been possible to verify even this one. It is tempting to suggest that it is a product of the author's imagination or forwarding rumours. It seems altogether unlikely that Conrad uttered such phrases publicly. Conrad reappears during Biegler's dream on the train to Budapest. There is a picture of him on the wall of K.u.k. Gottes Hauptquartier. Here he is referred to as Chief of General Staff. Conrad was an Austrian Field Marshal who was Chief of Staff at K.u.k. Generalstab when war broke out in 1914. He was known for his aggressive stance in foreign policy matters and advocated preventive warfare as a solution to the "Serbian question". He was head of the general staff until 1 March 1917, when the new emperor Karl I. dismissed him. Conrad is seen by many as carrying a major responsibility for the disastrous policies that led to the outbreak of World War I. "Die Tschechen müssen so wie so krepieren." To řekl též polní maršálek Conrad z Hötzendorfu počátkem ledna roku 1916 před 8. pěší divizí v Inšpruku. Adamička was an unusually apathetic captain at the garrison in Budějovice. Marek tells Švejk about him when they are locked up together, and how Adamička avoids dealing with the brutality of Dauerling. Marek also reveals that Captain Adamička has already been sent to the front, and in his shoes stepped major Wenzl who put Dauerling firmly in his place. The officer Josef Adamička from IR91 without doubt served as the prototype of Hašek's captain Adamička. [2.2] „To bylo za hejtmana Adamičky, to byl člověk úplně apatický. Když seděl v kanceláři, tu se obyčejně díval do prázdna jako tichý blázen a měl takový výraz, jako by chtěl říct: ,Sežerte si mě, mouchy.’ Při batalionsraportu bůhví na co myslel. Jednou se hlásil k batalionsraportu voják od 11. kumpanie se stížností, že ho nazval fähnrich Dauerling na ulici večer českým prasetem. Byl to v civilu knihař, uvědomělý národní dělník. Franz Wenzel, first on the right. Wenzl was a major at the garrison in Budějovice, who replaced captain Adamička when the latter was sent to the front due to his alleged sense of justice. Wenzl was the one that finally put fähnrich Dauerling in his place. 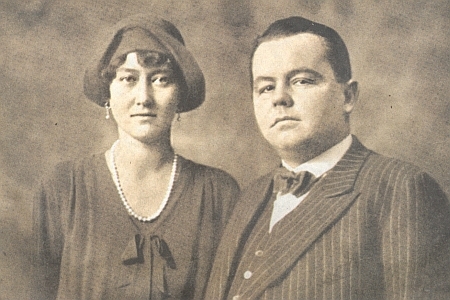 Major Wenzl had a Czech wife so his greatest fear was disputes between the nationalities. He also hated lower rank officers after an unfortunate episode years ago, when being drunk at a hotel in Kutná Hora. Wenzl held the rank of captain in Kutná Hora so he had obviously been promoted since. He only appears directly in the plot once, in a conversation with Schröder and Ságner at the hotel in Budějovice. In Királyhida his name reappears but this time he does not take part in the plot. He is mentioned during Švejk and Lukáš' episode with Wenzl's servant Mikulášek. The author provides some additional information: Wenzl had showed himself utterly incompetent by the Drina, he had ordered the destruction of a pontoon bridge whilst half his battalion was stuck on the other side of the river. Here in Királyhida he was getting back on his feet; he had been assigned administrative duties, and was also commander of the camp's shooting range. Wenzl is seemingly not part of Švejk's march battalion and disappears from the story before their departure to the front. Wenzl is introduced also in Dobrý voják Švejk v zajetí and plays a very similar role. At times the text of the two books is nearly identical. The prototype of major Wenzl was no doubt Franz Wenzel, a professional officer from Liberec. [2.2] O tom hejtmanovi Adamičkovi se pak říkalo, že má smysl pro spravedlnost, milý kamaráde, tak ho poslali do pole a namístě něho přišel sem major Wenzl. A to byl čertův syn, pokud se týkalo národnostních štvanic, a ten zaťal tipec fähnrichovi Dauerlingovi. Major Wenzl má za manželku Češku a má největší strach z národnostních sporů. Zítko was a reserve cadet from the school of one-year volunteers in Kutná Hora. He had gone to the press with the story about captain Wenzl having insulted a Czech waiter when drunk. The two had been enemies since Zítko had uttered something along these lines at a party where Wenzl was present: "What is any captain compared to the splendour of nature? The same nobody as any kadetstellvertreter". [2.2] ,Stačí,’ povídal kadetstellvertreter Zítko, ,zamyslit se nad tím, co je každý hejtman proti velebné přírodě. Stejná nula jako každý kadetstellvertreter.’ Poněvadž všichni vojenští páni byli tenkrát namazaní, chtěl hejtman Wenzl nešťastného filosofa Zítka zmlátit jako koně, a nepřátelství toto se stupňovalo a hejtman sekýroval Zítka, kde mohl, tím víc, poněvadž výrok kadetstellvertretera Zítka stal se pořekadlem. ,Co je hejtman Wenzl proti velebné přírodě?’ to znali po celé Kutné Hoře. Mlíčko was a carpenter from Vávrova třída who was the first war wounded from his regiment. Someone tore off his wooden leg and whacked him on his head with during a brawl at Apollo. All this is according to a story Švejk tells Marek in the arrest in Budějovice. Jabůrek was an artilleryman Marek and Švejk sang about in the cell in Budějovice. The singing provoked a visit from the officer on guard-duty, lieutenant Pelikán. The refrain of the song is accuratly reproduced in the novel, fragments of verse 12 less so. Kanonýr Jabůrek was a figure from a song story (cantastoria) Udatný rek kanonýr Jabůrek which had its background from the Austro-Prussian war of 1866. It is unclear whether it had any factual foundation, but in any case it appeared as a parody around 1884, perhaps even before. Jabůrek took part in the deciding battle by Hradec Králové on 3 July 1866. He keeps loading his cannon even as his limbs and other parts of the body are torn off, until his head is blown off and it reports to the general that he is no longer able to salute. The song is written in colloquial Czech. The first verse of the song was printed on a postcard from 1914, but in formal written Czech. It was part of a series of patriotic songs issued on post-cards in Prague after outbreak of war. Why this obviously satirical song was included in the collection begs a good answer. In 1986 Franz Hiesel made a radio play based on the song. It was broadcast both in West Germany (WDR) and Austria (ORF). Over the years the cannoneer has been mentioned numerous times in the Czech press and other publications. [2.2] Tak mně připadá,“ řekl jednoroční dobrovolník po krátké pomlčce, „že duch vojenský v nás upadá, navrhuji, milý příteli, abychom v noční tmě, v tichu našeho vězení si zazpívali o kanonýrovi Jabůrkovi. Pelikán was a lieutenant and reserve officer, mathematician in civilian life. He knew Marek and helped the two prisoners with cigarettes. Kretschmann was a senior lieutenant which at the hotel in Budějovice related to his officer colleagues how he had witnessed an attack on Serbian positions. He had returned returned from Serbia with a sore leg after having been gored by a cow. Spíro was a captain who at the hotel in Budějovice reeled off the most incoherent of observations. Banging his fist on the table, he concluded: "the Land Defense serves the land in peacetime". Ságner was captain in IR91 and takes part in the plot from Budějovice until the very last section of the novel. He is actually the last person being mentioned. Later on it is revealed that he has a past as a Czech patriot but lets his career take preference. He had attended cadet school in Prague together with Lukáš (see K.u.k. Infanteriekadettenschule Prag). In general the author's attitude towards Ságner is fairly neutral. Captain Ságner is first introduced by Marek but enters the plot soon after when the author relates from an officers party at a hotel in Budějovice. Marek also reveals that he was commander of the school for one-year volunteers in Budějovice. In Királyhida he was appointed commander of Švejk's march battalion and led the unit until the end of the novel. Soon after departure he was severely embarrassed by cadet Biegler in the mix-up with the decryption keys involving the book by Ganghofer. According to Rechnungsfeldwebel Vaněk, captain Ságner had served at the front in Montenegro, and had reportedly proved himself incompetent. The prototype of Ságner is no doubt the Austrian (from 1918 Czechoslovak) officer Čeněk Sagner. He was Hašek's battalion commander from 11 July to 24 September 1915, and before that they had served simultaneously in Budějovice and Királyhida. Schreiterová was an engineers' wife which Lukáš had fallen in love with after meeting her at the theatre in Budějovice. Dankl was a senior lieutenant who used to entertain at the officers club by sticking a herrings tail up his bottom to do a mermaid performance. This is what colonel Schröder told when reminiscing about the good old days. [2.2] Jeden, pamatuji se, nějaký nadporučík Dankl, ten se svlékl do naha, lehl si na podlahu, zastrčil si do zadnice ocas ze slanečka a představoval nám mořskou pannu. Schleisner was a lieutenant who could wiggle his ears, whinny like a stallion, miaow like a cat and hum like a bumblebee. Again it is colonel Schröder remembering the old days. [2.2] Jiný zas, poručík Schleisner, uměl střihat ušima a řičet jako hřebec, napodobovat mňoukání koček a bzučení čmeláka. Skoday was a captain who brought to the officers club three girls he had trained like dogs. There they engaged in debauched forms of entertainment. Schröder remembers this with joy as he thniks back of the old days. Marek was a fat one-year volunteer who Švejk met for the first time in the garrison arrest at Mariánská kasárna in Budějovice. They shared a cell for three days and entertained themselves hugely. Marek is the first person in the novel who is an outspoken opponent of the war.In civilian life he studied classical philosophy. Marek appears regularly throughout the rest of the novel, but rarely in such a prominent role as here. His real name is only revealed when he goes on report, so far he had been referred to as "the fat one-year volunteer". He had been arrested after knocking the cap off an artillery officer by mistake, which led to the discovery that he had forged the hospital sick book to get away from the barracks and take part in the nocturnal delights of the southern Czech metropolis. For this he got 21 days severe and subsequent kitchen service. This suited him perfectly, it was far better to peel potatoes than to be commanded to attack under enemy fire with his trousers full. He re-appears in Királyhida in the cell with Švejk og Vodička because he has refused to clean the latrines. In Budapest he is finally released and becomes Battallionsgeschichteschreiber, a duty he fulfils honourably: he writes the history of the battalion in advance. Marek is from then on part of the story all the way to the final pages of the novel. Marek has many traits in common with the author. From a purely biographical point of view, these are: one year volunteer, stay in the military hospital in Budějovice, imprisoned in the garrison arrest, editor of the "Animal World" who invented new animals. On ideas and personal qualities, these fit: hatred of the monarchy and its institutions, anti-war attitudes, glittering rhetoric, unusually good memory and grasp of detail. It is also obvious that Marek is a mouthpiece for Jaroslav Hašek's own political views. Experts seem to agree that the name of the one-year volunteer is borrowed from Karel Marek (1884-1945), a friend of Jaroslav Hašek from his youth. Václav Menger relates that the young Hašek often visited the Marek family at Královské Vinohrady and that he particularly enjoyed listening to the stories Karel's father told from his experience in the Prussian War of 1866. From him the young author also learnt many of the army songs that he was so fond of singing. Karel Marek actually was a one-year volunteer but in IR28, Prague's own regiment. 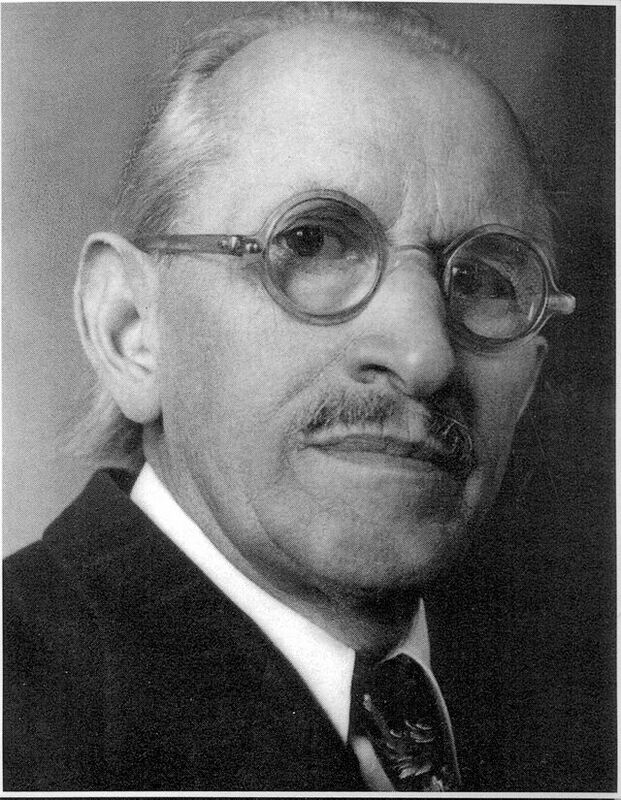 Karel Marek was, according to Augustin Knesl, born in 1884, son of Jan and Anna Marek. Like Jaroslav Hašek, young Karel studied at the Českoslovánská Obchodní Akademie in Resslova ulice, albeit two years later (i.e. 1901-1904). He worked as an official but was also an artist, mastering painting and writing. He met with Hašek also after the war and some material about the author was kept by his wife Marie Marková. At the end of WW2 Marek was interned in Terezín and 15 May 1945 he died as the result of mistreatment he suffered in the camp.